Join us for an evening of fun, food and fundraising. Our theme is “Tailgate & Celebrate” so wear your favorite team jersey or Madison spirit wear! This is our primary fundraiser, which funds the majority of our PTSA budget for the entire school year. We NEED your support! Tickets are $40 and include dinner. Raise The Paddle: This is our main fundraiser at the event. 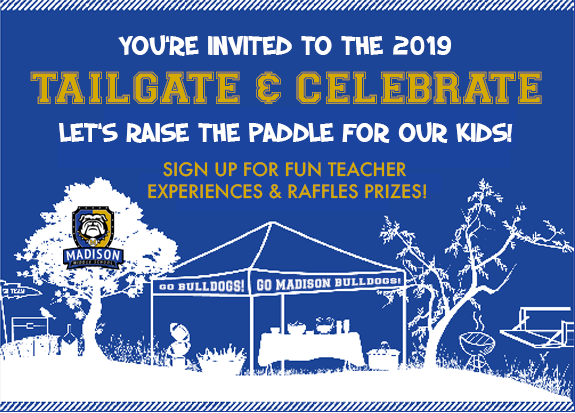 Just like the elementary school auctions, the auctioneer will ask for parents to raise their paddles to make a monetary donation. Parents raise their bid cards at the amount they wish to donate and we’re done! Raffle: We’ll raffle off fun items. Tickets are $10 each. Event: There will be food, adult beverages (Jello-shots are back), beer pong, corn hole and a DJ! Bottomless Beer Steins are back! 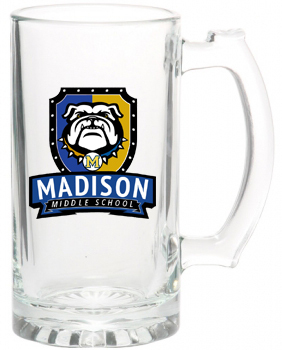 Purchase a Madison Bulldog glass beer stein as an add-on with your tickets, for $50 (unlimited refills). Perfect to take home for your Madison Student, for Root Beer Floats. Only 70 available, so purchase now! Contact Erika, the Madison Fundraising VP to help, donate, or with any questions!